Recommended by people like you! A Raimes "I cannot recommend these enough. Have been using them for years and is only thing that helps the pain. Fantastic"
Mr N Johnson, Cheshire "Dear Cleo , First of all may I say thank you, for the production of the CLEO ACTIVE, which has done all your companies claims. Namely that it will rid my legs of fluid retention. If your products hadn’t have been on the market, I would have had to used tablets which would have ruined my kidneys. When i bought them they cost £30 more than now. Thats great value for money." M Cartwright "I bought the massage leggings for my older sister and she has found them very helpful for her legs when they swell and ache. 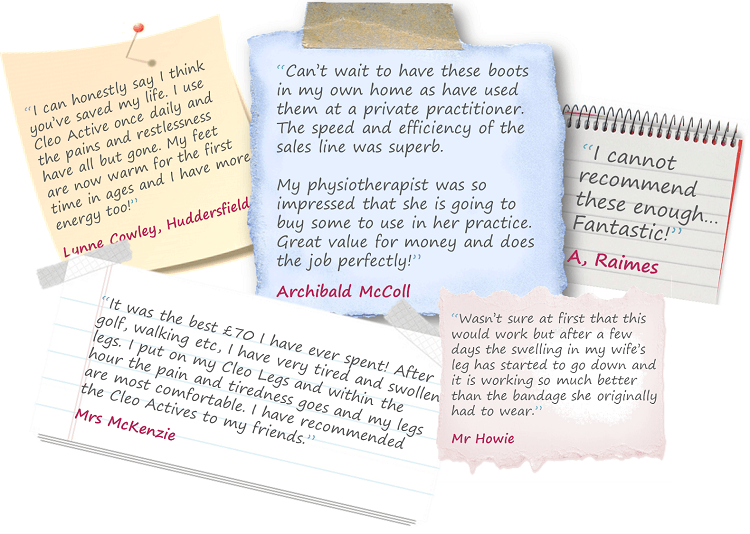 A Hearn, West Yorkshire "Suffering fluid in one knee and tired legs, I find 20 mins with the actives a good way to relax and massage away the aches and pains. My legs feel revitalised and young again." Mrs Proctor, Kippax "I have cerebral palsy and my lymphatic system is poor so I suffer from swollen legs & feet and my husband has restless legs. I use the flowtron system in hospital but we share the Cleo Actives at home – both of us get great relief from it!" Mrs Leith, Aviemore "I use Cleo Active when my legs are painful or very restless, and it has instant effects"
Mrs Sterry, Cardiff "The Active boots speeded my recovery from accident wounds and also helped recovery from heel damage after hip replacement surgery." Mr Thacker, West Midlands "I have plastic arteries in both legs and my legs swell up, using the Actives helps me a lot." Mrs Cahill, Sussex "I first started using Cleo Active after 2 hip replacements and have been using them ever since as they are brilliant at relieving the discomfort and swelling." Gillian H "Magic, really pleased with this item, would highly recommend. I use a reflexologist so am aware of puffy/sore places on my feet and ankles, nearly all gone in 1 week." Anon "I have such a problem with my legs swelling and they are agony at the end of every day. I now get such great relief after a 20 minute session. Just wish I could get an hour out of the machine." Margaret Grand "One of the best products I have purchased!"